So, what is this business about haunting? WOUNDS is a film that reflects on what it means to be haunted. In his address on May 23rd this year, President Obama claimed that he is “haunted” by the loss of civilian life from the drone attacks and wars carried out on his orders. Let’s take this seriously. What is haunting? To begin simply: haunting is when the dead refuse to die. It’s when they pull up a chair at the dinner table and demand that you set a place for them. It’s an expression of loss. And, it’s so disruptive that one cannot continue as if one were not haunted. Is this President Obama’s condition? This film focuses on the people who live in Waziristan and who live among loss. Material conditions, whether it’s the rubble after a drone attack or the grave of one’s kin, persist in reminding the living what they have lost. Only the conscious horror of destruction creates the correct relationship with the dead: unity with them because we, like them, are the victims of the same condition and the same disappointed hope. Only the conscious horror of destruction creates the correct relationship with the dead. I’ve been writing and speaking for some time about the limitations of international law as a language through which to think and speak about drone attacks. International law is slow. Missiles are fast. International law is caught up in constructing the proper order of violence. In other words, it doesn’t reject drone attacks or imperial power as such; it only raises objections when it finds that the violence has become excessive. This is not to deride legal work, but to point out what it constitutively is: a method to regulate the status quo. It’s not so much lawyers, but journalists actually, who have popularized legal language as the only frame through which we can talk about drone attacks and moral standards. Journalists regularly fail to look beyond the usual “experts” in policy and legal circles to other fields that may have an alternative to offer. We are becoming vulgar empiricists who seem to think that a truth not attached to a number (say, the number of “militants” vs. “civilians” killed), or a legal rule (for example: whether an action does/does not violate international law) is no truth at all. So, what is an alternative language to use to think about drone attacks? I think haunting is one frame through which one can re-direct the conversation from issues of legal standards to the lives lived and lives lost under the drones in Waziristan and elsewhere. The questions then turn on the material conditions and the loss suffered–not as evidence for legal arguments but as queries about what it does to a person to live in such conditions. The question is not, ‘Do I stick him in the “militant” or “civilian” column?’ but instead, who survives him? How do they deal with that loss? What is it like to live among the rubble? It isn’t through legal standards but though trying to understand the horror of the destruction that we create the correct relationship — with the dead, yes — but with the living, too. If our task as journalists — not the MSM who get paid a lot to shill for power — but the rest of us, in fact most of us: if our task is not to establish the humanity of others, then we might as well stop writing. See also guest post by Jesse Stavis. He has also published an article about what happened at the Progressive here. Wisconsin, I’ve been inundated with hundreds upon hundreds of tweets, emails and messages from people, both Americans, but also folks from Germany, the UK, France, Pakistan and elsewhere. They have been overwhelmingly positive, heartfelt messages (with a few nastier comments thrown in, but I imagine that is par for the course). I’ve tried my best to keep up and respond to, and/or acknowledge the messages in some way, but once again: Thank you for all of your messages of support. It has been inspiring for us to hear from all of you! When we posed our questions to the NSA recruiters, we did not expect to go viral. But some time soon after tweeting out my post, my blog crashed. So did the blog PrivacySOS (follow @onekade!) who had posted about it. By next afternoon, Huffpo had picked it up. Numerous blogs, local sites and news sites also reported the story including: Business Insider, The Guardian, Firedoglake, Sueddeutsche Zeitung (the largest German-language daily in Germany), WORT Radio, NBC15 (Wisconsin’s local channel which also features Jesse Stavis @tolstoved. Means one who studies Tolstoy), one of the other students who spoke), WeAct Radio, Isthmus, Wisconsin Reporter, Wonkette, ActivistPost, Daily Kos, Truthdig and RT America here and here (see below for one of the videos), among others. There have been some Youtube videos posted as well. I’ve made the audio downloadable as per several requests. 1. The recruiters in question were seasoned employees of the NSA, not newbies. They told us that together, they had 55 years of experience with the NSA. The female recruiter worked on South Asia and implied that she was in a senior position in that office. That was the impression others I’ve spoken with also had. The male recruiter worked on China and Korea. affects African-Americans and Latinos. And, it’s the same reason why –when hunting for ‘terrorists’– American security forces obsess over Islam, and the mainstream media tends to present Muslims as the face of terror even though white hate groups are on the rise. 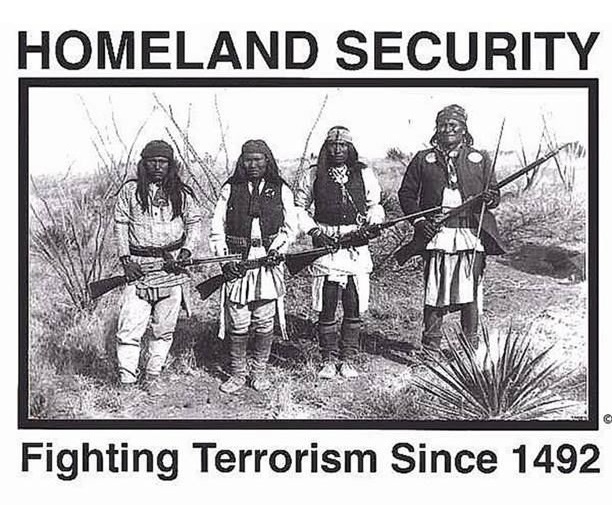 In fact in 2009, conservatives so heavily criticized the Department of Homeland Security when it “reported that white supremacy is the US’s biggest threat for domestic terror” (ThinkProgress) that Janet Napolitano ended up withdrawing its report. So, there’s a racial politics to the surveillance state. The marginalized, poor and non-white are likely to bear the brunt of the state’s violence. But, in the end, it affects the entire social space. First of all, it has a chilling effect on dissent, particularly in these communities. Secondly, for the police or the FBI or the NSA or the drones to come for some of us requires that the rest of us agree or at least, remain silent. I think that silence is produced: through the jingoism of television whether it’s the evening news or shows like NCIS, 24, or Homeland as well as through attacks on education, research and dissent. Finally, there are all the smaller ways of disciplining people into silence, things we even do to each other. You are told it’s rude to ask questions. This is not the right time. This is not the right space. Those are not the right people. Shut up. Shut up. SHUT UP. That kind of social space kills independent thought. It produces thinking that is vehemently opposed to asking questions of NSA recruiters and by extension, the state. Such thinking is more angered by the whistle-blowing than what it reveals. To paraphrase a dead French guy badly, the surveillance state has to change people/populations into the kind of group that basically remains silent. That is what is needed first in order to make the unthinkable possible and finally, normal. This is why, when they come for some of us, they actually come for all of us. Therefore, a critical response can only succeed if it is able to understand the entire structure as a whole, that is, as long as we continue to draw distinctions between people that ought to be surveilled and those that should not be surveilled, we will fail. The point –and the real test– is learning to stand in solidarity with people who are not like you or me or us. 3. “The globe is our playground.” A little nugget of honesty about the worldview of the intelligence and military community. 4. They are just doing their jobs. I’m not sure why this is a defense. It didn’t work at Nuremberg. And, it shouldn’t work now. This is not to compare what is happening now as somehow equal to or better or worse than the German holocaust, but to underscore a philosophical point Hannah Arendt made about the nature of modern evil: It’s banal. That means it hasn’t got a pitchfork or horns sprouting out of its head. Rather, it is thousands of ordinary people just doing their jobs. So, some people go on just doing their jobs and other people go on not asking questions for fear of appearing rude (Jesse talks about how the high school teacher sitting next to him during the session kept muttering about our ‘rudeness’), enraged, irrational, naive. This is how, together, we build monsters. What has struck me about the anti-war movement in America in these last few years –perhaps it is different elsewhere and perhaps it was different before– is generally how polite it has been. How ironic to chant, “Whose streets! Our streets!” while politely walking into pens and free speech zones. How strange to demand an end to the war while politely conceding to the demands of the NYPD that protesters not use Central Park, that they only march on these streets and not those streets so that order can be maintained, so that things can carry on as if there were no protest at all. I am not arguing for blind rage, but I think anger –articulate, politically engaged, critically minded anger that holds the line– can be a virtue in these times. 5. Edward Snowden should’ve stuck it out instead of “running away.” This is interesting to me because I think this speaks to a kind of Christian imaginary: the hero as martyr, like Jesus, who should hang on the cross. That is apparently what will redeem the worth of these revelations. I am not saying that the people who make this claim are Christian; I am only observing that long after secularization, forms of Christian thought and habit hang around, and I think this is one of them. It is a very specific kind of typology for a hero, and one that only makes sense in a context where people (whether they be actually Christians or Muslims or Hindus or Jews or atheists or whatever) are habituated to the idea of Jesus’ martyrdom for our redemption. It’s out there in the social space. Hell, think about the end of Harry Potter. 6. To the people telling me to grow up, I’m 5 ft 1.75 inches, and I’m pretty sure I’m not growing any taller. And to those wondering if I’m a “foreigner,” well, if I am one, so are you. I do get how my name trips up your black-and-white world though. If it helps, you can call me Maddie. Let’s not forget about the corporations who surveil us too. Finally, once again thank you so much for your messages. It has been inspiring for us. So, I’ve been trying to get a hold of a video camera for a week now. First, I contacted a documentary house here, a rental shop for video equipment. AZ, the owner said “Sure.” I called the next day to set up a time for pickup. No response. I called again. I texted. Then I called. It went on like that for 3 days. Then on a fine Monday evening, I received a text from him “Sorry, when do u want to pick up the camera?” I responded immediately, “Today if possible,” and then since it was already evening, I added, “or tomorrow.” And then to make sure, I called him. I told him I needed a camera with a working firewire port. I didn’t actually need to film. I needed to capture tape. That means using the camera to take footage from the tape to the computer where I would edit it. We decided on a time. 1pm Tues. He didn’t show up. I waited outside the doc house for half an hour before he picked up my phone calls and told me he was “on his way.” I was now late for another appointment, and he said he could have the camera sent somewhere if I couldn’t wait. Finally, he told me he was near the place of my appointment and we decided on a spot where he would just hand me the camera, outside a well known KFC on a main road. He said he was 10 minutes from there. I got there and after another half hour of waiting I knew that he was not “10 minutes from there.” My cabbie, whom I trust, offered to drop me at my next appointment and to come back and wait for the camera. So, that’s what we did. I finally received the camera. I was exhausted. It’s Karachi heat after all, but I had one shift with it. I connected all the wires quickly, the ports, the hard drive, the computer, and finally the camera, a taped up, grizzly miked thing that looked ready to fall apart. The tape turned on in the camera monitor. Exciting. But, it wouldn’t show up on the computer. The firewire port didn’t work. After a week wasted on that effort, I asked a friend to put me in touch with another fellow. It took a week for my friend’s contact to get back to him. I called the guy, FZ. He didn’t want to rent me the camera to capture tape because it can be hard on the camera. That’s true. But, he was willing to rent me a VTR, the device I need to capture tape. It’s very expensive so I don’t own one. And he doesn’t rent it usually, but he was –I think on my friend’s good graces– willing to make an exception. He said “Just come on over. I’m in the office during the day.” We settled on meeting the next day at noon. I texted a confirmation with the time after we got off the phone. The next day, as my cabbie and I neared the area of FZ’s doc house at the appointed hour, I called him to get directions. No response. We finally pulled up alongside a road. After some texts and another phone call, he picked up. It was noon. He’d been asleep. He was still at home. When I expressed surprise, he responded by informing me that “It’s jummah” (Friday, prayer day), as though he couldn’t have foreseen that the day after Thursday would be Friday. He said he’d be in the office “after prayers”. That can literally mean anything. “Or maybe stop by in the evening,” he said. I live over half an hour away. Every trip requires calling my cabbie and coordinating. “Accha, haan yeh kar sakhtay hain” Oh yeah, that can be done. And I hung up. I’m waiting. In total, it’s been two goddamn weeks. This is neither my first frustration in Pakistan nor will it be my last. After he set about building barracks for his soldiers in Gizri and Clifton (Karachi locales), Charles Napier who conquered and ruled Sindh for the British said of the locals, “Public works go slowly in this country. The people are idle and the climate ennervating.” It’s a refrain oft-repeated still (though we are at the same time somehow very busy producing Taliban and suicide bombers according to the media), and in my rank frustration and sheer annoyance, it’s not difficult to believe that. Clearly, there is a communication gap, though I’m aware of ‘Pakistani Standard Time’ (PST). When a wedding is held, all the guests know to come about 2 hours after the stated time in the invitation. I once made the mistake –in Ohio– of showing up at a Sikh friend’s wedding at the correct time only to see that the hall was still being set-up. There are probably social cues I’m missing, or more simply, this is how everyone expects things to be done, so I’m supposed to build it into my timeline. Still, protests, at least the ones organized by “civil society”, that loose network of westernized elites, start on time. So do events at T2F, a hip cafe attended by the same class (and which I also frequent). Pakistanis are thus multiply conditioned (white people time and desi time), but we’re not all on the same page about when to code switch. It’s all very well when there’s a gora waiting, but otherwise it’s apparently not clear who’s following what time code. I am tempted to speculate that this is all class inflected too: our sense of when to arrive, when to leave, when we have taken up too much time is connected in some way to the ideas we hold about individualism, sense of obligation, community. On birthdays, your friends pay for you in America. Here, you pay for them. It’s partly a class and westernization issue. That caused some confusion on my birthday when some offered to pay while others assumed they were being taken out. Upper middle class Americans live by compartmentalizing their time. On schedules. Capitalism requires it. Work 9-5. Meet for coffee 5-6, etc. They do a lot, mix a lot, but the mixture of modes of privacy and compartmentalization seem to leave them with a sense of alienation. I’m not very good at it, something I never learned properly. My parents always did a lot: my father was holding down at least two jobs, usually three; my mother also worked full-time. Then they shared the household responsibilities. I too held down multiple jobs as have my siblings. But, we were always pushed along by forces greater than us, by some sense that if we fell off the wheel, it would grind us under. I have now for the first time in my life, managed to gain some time, to have time. I’m only just now learning to compartmentalize it. I suppose that’s part of my becoming American, a particular kind of American anyway, a particular class. When I go to interview my Pashtun interlocutors, they find it rude that I don’t stay all day. My skin tone or that I speak Urdu is misleading. Some people say it’s great that I can be in this world and that world, but the thing is, I don’t get to choose whether I’m in or out. Others decide; I play along or try to tweak it. But, it’s just a matter of time. All well enough, except if we’re all looking at different watches as we appear to be and that indicates a different sense of experience and orientation as I suspect it does, how do we ever expect to organize any revolution? Some sense of “homogeneous empty time”may be necessary, not just for nationalism, but for a sustainable modern revolution. Doesn’t a revolution, after all–even if it is anti-state–require the same sense of solidarity with people you have never met and may never meet, just as nationalism does? Revolutions, like nationalisms, are imagined constructs too and they may also depend on some shared sense of time. The spine of the lawyers movement was a set of lawyers associations, groupings and cliques with shared practises. That’s why it worked. For many upwardly mobile Pakistanis in America, there is a sense of urgency, of not enough being done in Pakistan, but I think abroad, it becomes easy to forget the sheer problem of logistics or to deal with issues of time. Travel from one part of the city to another in Karachi is difficult; people don’t arrive to meetings or conferences at the scheduled hour; there are other cultural barriers: can I really blame a Pashtun in Landhi or Macchar Colony if she presumes that I’m not invested in the struggle because I come to her area only for an hour or half a day? She is poor; I am not. She lives in a targeted area; I do not. She takes my compartmentalization for shallow engagement. Perhaps it is. Compartmentalized activism is a luxury. As Pakistani-inflected in America, the force of that country’s barbaric politics hounds me. Withdrawal is not an option. As an American-inflected Pakistani in Pakistan, I belong to a different class here. I’m not targeted in the same way. I have respite. The complications multiply. I don’t have answers, but I’m hoping they will come in time. I got a call back from FZ. Work had come up. He needed to use the VTR today. So can I get it tomorrow?